IN COLLABORATION WITH CELEBRATED BAND CURATOR, ‘EUSTACHE DAUGER’. “FIRST COLLECTION OF REPURPOSED HERMES OF PARIS SILK WATCH STRAPS SOLD OUT IN DAYS”. 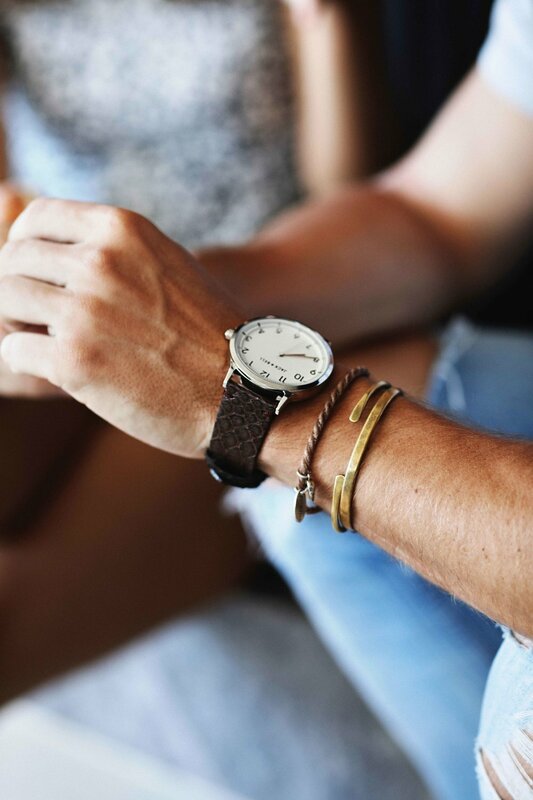 HE ADDS “I’M NOW REALLY EXCITED TO PARTNER WITH JACK + BELL FOR A ONE-OFF RANGE OF HAND CRAFTED LEATHER STRAPS”. THE ALIGNMENT CAME ABOUT ORGANICALLY OVER DINNER, WHERE THE THREE CONNECTED OVER A MUTUAL LOVE FOR HIGH QUALITY AND WELL-CONSIDERED DESIGN, AND A SHARED DESIRE TO BRING THIS TO THE MARKET AT AN ATTAINABLE PRICE. MONTHS LATER, THIS CREATIVE VISION WAS BROUGHT TO LIFE THROUGH 6 CO-DESIGNED BANDS, SIZED FOR BOTH MEN AND WOMEN. THE WATCH ARCHITECTURE REMAINS TRUE TO JACK + BELL’S SIGNATURE MAKE, FEATURING TRIPLE PLATED STAINLESS STEEL CASING, SAPPHIRE CRYSTAL FACING AND SWISS RONDA MOVEMENTS. “COLLECTION E.D. EXPRESSES OUR COMMITMENT TO DESIGN EXCELLENCE, AS WE SEEK TO COLLABORATE WITH LIKEMINDED HIGHLY SKILLED CRAFTSMEN. THE RESULT IS A CAREFULLY CONSIDERED TIMEPIECE, CO-CREATED USING THE BEST MATERIALS, SOURCED FROM PREMIUM MANUFACTURERS. THE LIMITED-EDITION RANGE SPEAKS FOR ITSELF IN QUALITY, DESIGN AND PRICE POINT, AND WE NOW LOOK FORWARD TO SHARING THIS WITH A WIDER AUDIENCE” PETE KENNON.